The Prince George’s County Fire/Emergency Medical Services Department started preparing for the arrival Hurricane Irene days in advance. Even while continuing to deal with the aftermath of a rare 5.9 earthquake just days earlier, Department leadership started to focus their attention to the impending storm. 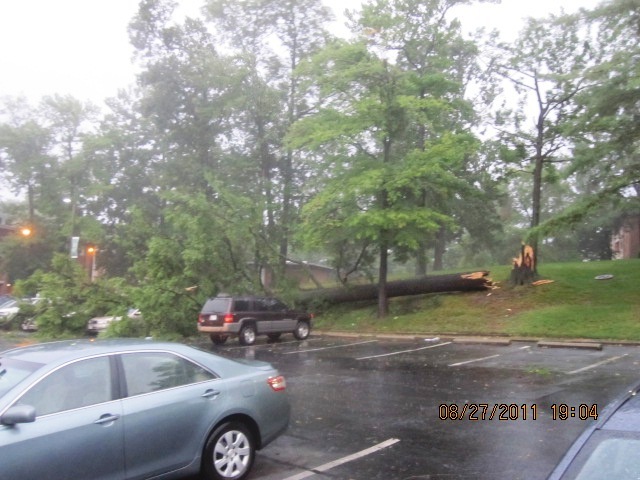 Hurricane Irene's impact was forecast to start being felt in Prince George's County the afternoon of Saturday, August 27, 2011 with worsening conditions late in the evening into early Sunday morning. Fire Chief Marc S. Bashoor returned early from the International Association of Fire Chief’s Fire-Rescue International Conference in Atlanta, Georgia, to help prepare Fire/EMS Department’s assets for what had been called the “storm of the century” by analyst’s on the Weather Channel. “As Hurricane Irene churns towards Prince George's County, please take the opportunity now to prepare yourselves, your families, and those less able to care for themselves. Folks in need will depend on us as first responders. I want to ensure you've taken care of yourselves and your families now - so you'll be available to help out if called upon. Whether it's cleaning out gutters, ditches, and drain pipes, or ensuring you have flashlights, batteries, sandbags, and at least a 3-day supply of food/water, or ensuring vehicles and generators are fully fueled and portable supply cans filled, please take those steps now. We should ourselves, and as a challenge to others, also take this opportunity to make sure all of our smoke alarm batteries are fresh and working. A Departmental Operations Center (DOC) was established at the Cranford-Graves Fire Services Building in Landover Hills and opened on Saturday, August 27, 2011, at 7:00 am. The DOC was to work independently from the County Emergency Operations Center other than a Fire/EMS Department liaison. The DOC was to operate under a 12-hour operational period, under an ICS format, with Command, Operations, Logistics, Public Information and Planning Sections activated initially. Meetings were held in the DOC as well as teleconferences with command officer in the field. Being as the storm event was occurring over the weekend, several support functions such logistics and the apparatus maintenance division were staffed and operational to ensure continuity in operations. By starting to plan for the significant weather event days in advance the Fire/EMS Department provided dedicated staffing for; 30 engines, 5 ladder trucks, 3 heavy duty rescue squads, 24 ambulances, 11 paramedic units and 5 paramedic ambulances. An additional 16 units were placed in service that would respond on incidents such as wires down, flooded conditions and investigations. Two personnel inside utility type vehicles staffed these units. There were about 25 personnel operating between the EOC and DOC. There were Federal, State and County Declarations of an Emergency for the events involving Hurricane Irene. During the storm it was predetermined that assignments would be reduced. For example, a box alarm would normally receive 4 engines, 2 ladder trucks, 1 squad or additional ladder truck and a command officer. During the storm, a box assignment would receive 2 engines and 2 special services plus a command officer. Fire Chief Bashoor had pre-issued a directive that if sustained winds reached 50 mph that we would suspend responses. Operating in such conditions greatly diminishes our ability to do our job safely. The winds came close but never reached the level where we would stop responding on calls. Throughout the day of the storm apparatus was staffed by nearly 400 personnel that included 250 volunteers and 150 career firefighters, EMT’s, paramedics and civilian personnel. On Saturday the Department responded on 740 calls for service compared to a normal 24-hour shift average of 375. The highest numbers of calls were in the 11 PM hours when 90 calls were handled. 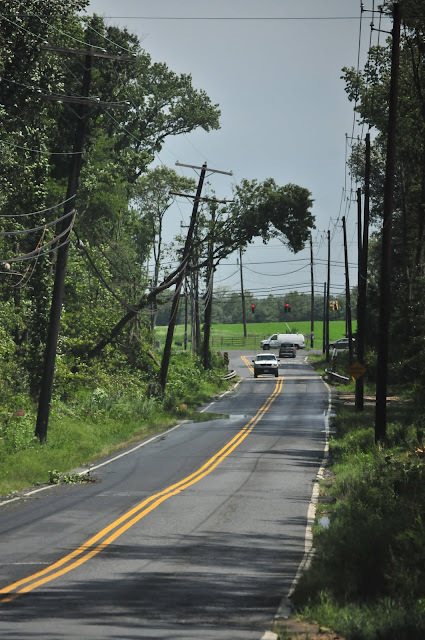 The majority of incidents, as predicated, involved utility lines and poles, transformers, flooded conditions, fallen trees and activated fire alarms. We never had to deal a significant incident. 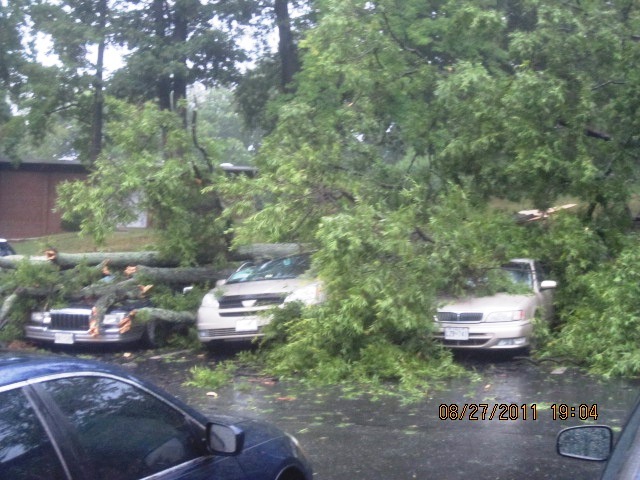 Fortunately, there were no injuries or significant incidents that were a direct result of Hurricane Irene. The DOC remained functional until early Sunday afternoon. The County EOC closed later Sunday afternoon. County Council Member Eric Olson, Fire Chief Bashoor and Homeland Security Director Brian Moe at EOC. Bowie, Maryland –The Prince George’s County Emergency Operations Center has officially closed. Prince George’s County Executive Rushern L. Baker, III will be holding a press briefing at 3:30 p.m. at the 9-1-1 Communications Center located at 17321 Melford Blvd. ; Bowie, MD 20715 to update residents on the aftermath of the storm and its impact on the County. • To date, there are no injuries related to the storm or serious public safety incidents. • PEPCO is reporting 93,126 Prince George's County customers without power. • BGE is reporting 23,481 Prince George's County customers without power. • SMECO is reporting 5,900 Southern Prince George's County customers without power. • All the occupants of our 2 shelters in Brandywine and Brentwood have returned home this morning, the shelters are shut down. 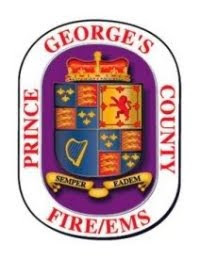 • Prince George’s County 9-1-1 center has received 5,330 calls today. • The Hurricane Hotline has received 1089. • Please continue to follow tweets @CountyExecBaker and Facebook at "County Executive Rushern Baker"
Early this morning, at about 2:30 am, a large mature tree was toppled by the strong winds of Irene near the location of an open and functioning County Emergency Operations Center (EOC). County employees, assigned to work the overnight shift at the EOC, had parked their cars in the 6800 block of Webster Street leading up to the Cranford-Graves Fire Services Building in Landover Hills. Fire Chief Bashoor described the scene this way, "This large, nearly 100 year old tree crushed several cars and temporarily cutoff vehicular access to the County EOC. The DCAO for Public Safety, Homeland Security Director, Fire Chief, and about 40 other officials were safe inside the EOC - albeit working on generator power." Apparently, a lesson was learned the hard way that EOC workers are not immune from incidents of damage while working to serve citizens that are dealing with the same frustrations. The incident served to remind us why we were there. Attached picture, by Fire Chief Bashoor, shows fallen tree (cut), damaged vehicle and the Fire Services Building in the background. A Ritchie family of 9 can thank a working smoke alarm for awakening them and allowing time to escape their burning home. At about 8:15 am this morning firefighters were dispatched to a report of a fire on the second floor of a home at 8100 Thornfield Terrace. Firefighters arrived to find smoke coming from the house and ensured all occupants were safely outside. Firefighters then stretched hose lines inside and extinguished a fire found in a second floor bedroom. After losing electrical power overnight, as a result of damage from Hurricane Irene, the family used candles for illumination and left one burning unattended/forgotten. The candle eventually ignited a fire. In the initial stages of fire ignition a battery powered smoke alarm activated and alerted the sleeping family to the fire and allowed them time to escape safely and provide early notification to the fire department. Unattended candles are one of the leading causes of home fires and during power outages we ask everyone to use battery powered flashlights and lanterns to avoid exactly what occurred here. Working smoke alarms save lives. If this alarm was not working the potential for injury, death and additional fire damage to the home is highly probable. County residents can receive a working smoke alarm installed in your home, free of charge, by calling the Fire/EMS Departments Smoke Alarm line at 301-864-SAFE (7233). If you already have a smoke alarm, test it monthly to ensure it is working and provide fresh batteries at least once-a-year. Remember, Safety First ensures everyone goes home.